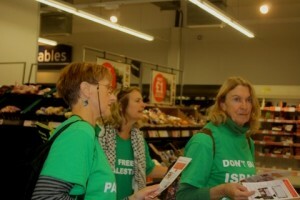 On the 26th of October a group of activists staged a successful demonstration inside the New England Street Sainsbury’s supermarket in order to expose the company’s complicity with Israel’s violations of Palestinians’ human rights, and the hollowness of the company’s claim to be an ethical trader. The group filled baskets and trolleys with Israeli produce, then explained to shoppers why they were asking them – and Sainsbury’s – to stop buying Israeli goods, making the link with apartheid South Africa clearly and repeatedly. 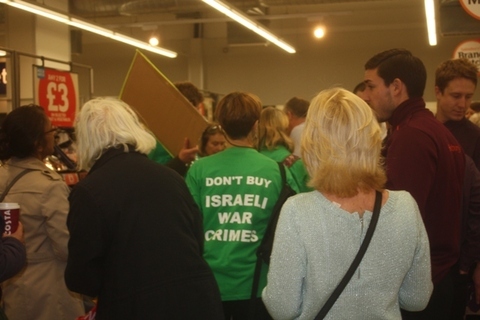 One member of the group reported: “One of the most noticeable features of the protest was the overwhelming support we got from shoppers, many of whom thanked us for doing the protest, or said really clearly that they supported us. One man who was doing his shopping when we started, stayed throughout, and questioned the manager at length about why they buy Israeli produce. Several other shoppers did the same. “Sainsbury’s staff surrounded the group, but did not attempt to take their trolleys and baskets away. One asked me about what evidence we had, and seemed satisfied with the clear answer I was able to give. The demo is part of a national campaign focused specifically on Sainsbury’s. This is because the company takes great pride in its ethical trading and corporate social responsibility policies, but has so far refused to acknowledge the contradiction between these policies and their extensive business with Israeli companies that profit from Israel’s illegal settlement project in the occupied Palestinian territory (oPt). 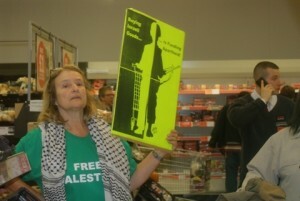 The campaign aims to put pressure on Sainsbury’s to follow the lead given by The Co-operative Society, in refusing to do business with any company that deals with illegal settlements in the oPt, recognising that ethical trading is incompatible with ethnic cleansing, apartheid and violations of human rights. You can find out more about the national Sainsbury’s campaign on their website.